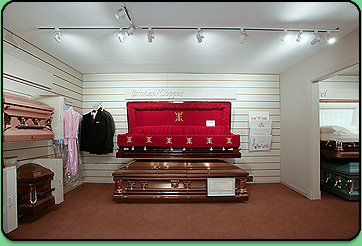 We offer a complete and wide selection of caskets. The caskets offered for your selection range from inexpensive cloth covered woods, solid hardwoods of Poplar, Maple, Oak, Cherry, Pecan, and Mahogany. Our metal caskets range from light gauge Steel, to heavy gauge Steel, Stainless Steel, solid Copper, and solid Bronze. Some of our caskets can be personalized with special end corners and interior panels such as American Flags, veterans emblems, Praying Hands, Crosses, etc. We have a wide variety of cremation containers and memorial urns from which to choose. Memorial Urns are permanent containers for the cremains. Also a wide range of styles and prices appropriate for burial, niches, scattering, keepsakes or discreet placement in your home. We have many personalization options. 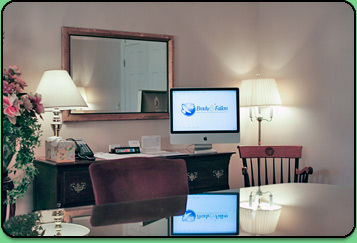 We understand that funeral arrangements are always difficult. Knowing that no one ever looks forward to entering a room full of caskets, we have a computerized virtual showroom available that will make these moments as easy as possible, along with a traditional showroom.